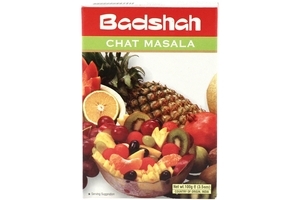 Badshah Chat Masala in 3.5oz pack. Badshah Chat Masala is the spice mix used in all different varities of Chat foods in India. This masala has a mild sour taste and is usually made by mixing pepper, cumin, rock salt and dried mango and many more spices. Chat refers to a plate of savory snacks from India. Ingredients of Chat are commonly yogurt, potatoes and onions. Sprinkle Badshah Chat Masala over your favorite chat delicacy and enjoy the spicy flavor. dry mango, black salt, cumin, salt, coriander, chilly, musk melon, black pepper, ginger, cytric acid.